EVO Minecraft MOOC has been meeting regularly in-world this January and February, as they usually do this time of year. This video was made Jan 28, 2018 and features Dakota Redstone, Abu Fletcher (Don Carroll), Jane Chien, Mattie Tsai, Maha Abdelmoneim, and Mircea Patrascu. We were a week into trying to crack into an underwater temple that Abu Fletcher found on a cross-ocean adventure in Minecraft. At this point the team have built a pier out to the temple site and have made great progress in placing glass around the temple and somehow purging it of water. They are now trying to extend their tunnel toward where they feel is the entrance and shore up the massive water leaks with sand. The recording has sound issues because where I am in UAE the computer that does Discord lags awfully when running Minecraft, and the one that runs MC will not do Discord, so I’m having to pick up the Discord sound using a USB mic into which I’m speaking while picking up the discord off the other computer played at high volume into the USB mic. Not the best arrangement, but it works. Even worse is happening at the temple. The sea environment is patrolled by sea creatures. One kind is a jellyfish that swoops over players and induces a kind of comma that prevents effective use of tools. The only anecdote is to drink milk to counteract the venom. MC is about solving problems, so to break objects at the temple, players have to sustain a milk supply. There are cows back on land. Dakota penned a few up. If you right click on them they will give you milk if you have a bucket. You can craft buckets from iron. Dakota set up chests at the foot of the pier and put buckets inside which players could take to the cows, right click on them and get milk. As the work moved out to the temple itself, Mattie brought a cow out in a boat where Dakota had set up chests at the end of the pier where glass was being erected around the temple and sand used to drive out water. In this video the players are working to remove the sand and then plug the leak letting water back in. They are constantly getting poisoned by sea creatures and having to drink milk to continue the work. Even worse is a creature called a guardian which can reach its tentacles from the sea onto the pier and even reach places on land. The tentacles are lethal. Fortunately in our game configuration, we don’t lose inventory when we die and we can return to our place of death by using the /back command. So these creatures cause setback and inconvenience, and hinder the work, which is conducted as a cooperative effort guided mainly by our kindly colleague who calls himself Dakota Redstone. When we engage in directed project like this, it is an illustration of how this might work in a language class, where players / students resolve on a mission (in this case getting at the loot in a sunken temple) and then communicate with each other on how they might engineer a solution, and then carry it out with some difficulty and coordination involving constant communication and interaction. It’s goal-directed and task-based. It’s fun and compelling, and intrinsically motivates people to work together. Through playing meaningfully in this way, we learn first-hand how this can be a ripe environment for language learning. Here are another couple of videos made by Don Carroll, Jane Chien, and her young son Mattie Tsai, again showing game play and how players interact and work together. The link to the recording and the PDF of the speakers will only be sent to registered participants and both the recording and the PDF presentation will be deleted after 2 weeks. Certificates of attendance will only be sent if the registration data is COMPLETE. Participants who enter the room via a pseudonym or are not identifiable by their full names and surnames will be expelled from the room. Registration during the webinar remains possible for spontaneous participants but must be completed within 15 minutes after their entry and must be complete (including postal address of their school, university, institution, organization, company or private address). Remember to enter both your fisrt AND last names before entering the room. If you haven’t registered yet, you are expected to do so at least during the first 15 minutes in the room. Gamification has hit our school in an innovative way! Listen as two educator’s from Phoenix AZ describe how professional development for educators is building skills and community, and how it metamorphosed into a model for students to also achieve above and beyond what is taught in the regular lesson. We hope what we share will give inspiration to you to implement some gaming ideas to make education fun again! My favorite things to do are: games nights with friends, going to movies, reading, and traveling. I have a dog named Toby. More information and session details are at http://live.classroom20.com. If you’re new to the Classroom 2.0 LIVE! show you might want to spend a few minutes viewing the screencast on the homepage to learn how we use Blackboard Collaborate, and navigate the site. Each show begins at 12pm EST (Time Zone Conversion)and may be accessed in Blackboard Collaborate directly using the following Classroom 2.0 LIVE! link at http://tinyurl.com/cr20live. All webinars are closed captioned. On the Classroom 2.0 LIVE! site (http://live.classroom20.com) you’ll find the recordings and Livebinder from our recent “9th Anniversary Celebration & Open Mic: Back to the Future Classroom 2.0 Style” session facilitated by Paula Naugle. Click on the Archives and Resources tab. On Sunday, January 14, coordinators, moderators, and participants in the Electronic Village Online EVO 2018 gathered in Bb Collaborate for the annual kickoff event. They had been invited to join us live and help us kick off 5-weeks of unparalleled community building with a celebration of EVO2018 moderator and participant voices, hosted by lead coordinator Nellie Deutsch. If you leave it to the last minute or are truly unable to resolve your connection problems, or simply want to watch on YouTube, you can tune in to the live stream on Vance’s YouTube channel, https://youtu.be/GTMccZkIjhI (recording embedded above). Are you a fair tester? Please note that registration for the sessions will take place from January 8 – January 14, 2018. The sessions begin on January 14 and continue until February 18. To register for a session, follow the instructions on that session’s page (Session pages are linked to the titles in the CfP.). EVO sessions can be time-consuming, so we encourage you to sign up for no more than two sessions!As always, EVO sessions are free (you need only a computer with Internet access and a desire to learn) and open to all, no matter what your professional affiliation. The sessions carry no academic credit, and participants may choose the level of involvement that works for them.Mark your calendars now for EVO registration, January 8 – 14th and get ready for an unforgettable experience!Please share this invitation with your colleagues and e-lists. We are always thrilled when Steven Anderson, returns to Classroom 2.0 LIVE to share his passion, enthusiasm, and expertise as an educational leader with us. His always practical advice coupled with his great sense of humor and terrific resources provides support for all of us in our mission to improve learning experiences for ALL students, teachers, and administrators. In this week’s webinar Steven will be sharing about how to provide accessible digital content for everyone. Accessibility isn’t just something that concerns a small portion of the school population. It’s important for every educator to understand accessibility and how to ensure that the content, process, and products we create and have students create are able to be viewed, enjoyed and shared with anyone. Join Steven W. Anderson (@web20classroom) as he discusses accessibility and how every educator can make their content more accessible. Steven Anderson is a Dad, learning evangelist, educator, speaker, and author. As a former classroom teacher and Director of Instructional Technology Steven is highly sought after for his expertise in educational technology integration and using social media for learning. As @web20classroom he regularly travels the country talking to schools and districts about the use of Social Media in the classroom and how they can better serve students through technology. Steven has been a presenter and keynoter at several national and international educational conferences, including ISTE, ASCD, FETC, WISE, VSTE as well as numerous state and local conferences. Steven is the author of 3 books: The Relevant Educator: How Connectedness Empowers Learning,The Relevant Educator: How Connectedness Empowers Learning, co-authored with his good friend and social media maven, Tom Whitby, The Tech-Savvy Administrator, part of the ASCD Arias series, and Content Curation: How To Avoid Information Overload, part of the Corwin Connected Educators Series. He is also responsible for helping create #edchat, a weekly education discussion on Twitter that boasts over 500 weekly participants. Steven has been recognized with the the 2009 and 2011 Edublogs, Twitterer of The Year Award, a “Top 50 Educational Innovators” award from the Center For Digital Education, a Microsoft Heros of Education award, along with a 2013 Bammy Award, recognized worldwide as the Educational Emmy, for his work with #edchat. On the Classroom 2.0 LIVE! site (http://live.classroom20.com) you’ll find the recordings and Livebinder from our recent “Intentional Learning Centers: Making the Most of Station Rotation” session with Brittany Miller. Click on the Archives and Resources tab. We are so excited to have an extraordinaire librarian and exemplary Buncee Ambassador, Shannon M. Miller, as our special guest to share some of the incredible things educators are doing with Buncee to bring interactive learning experiences to their students. Shannon has helped teachers around the world learn about the power of this amazing tool and will share her stories and examples about how empowering Buncee is for students. She will share 10 ways Buncee can be used in the library with examples of global Buncee projects including Dot Day, a Global Buncee Recipe Book and Buncee Buddies just to mention a few. Even though these are perfect examples for librarians they are also excellent ideas for all teachers! Buncee allows students to share their knowledge and creativity in an easy, engaging way and provides a perfect medium for encouraging student voice. She will share ideas for creating newsletters, announcing events, research projects, student sharing of books and reading, and collaborative global projects. Shannon is a mom and wife. She served as the K-12 district teacher librarian at Van Meter Community School District in Iowa for 8 years. Shannon is now an international speaker and consultant who has a passion for education, librarianship, technology, social media, and making a difference in the world and lives of others, especially children. Shannon is the Future Ready Libraries and Project Connect Spokesperson, Buncee’s Teacher Librarian Advisor and Cantata Learning’s Teacher Librarian Advocate. She is part of Best Keynote and EdSpeakers. Shannon is a Skype Master Teacher. Shannon is the author of the award-winning The Library Voice blog and enjoys writing for various blogs, journals, and other forums. She is currently writing two children’s book series with Cantata. In 2014, she was named a Library Journal Mover and Shaker. In 2016, she was awarded the Making it Happen Award by ISTE. She serves on AASL Best Websites, ALA Committee on Education and ALA Equity, Diversity and Inclusion Implementation Working Group. ; Canva Educational Advisors; GoNoodle Ambassador; United Tools for Schools Committee; eduBuncee Ambassador; Remind and Tackk Educator, FableVision Ambassador, and Social Media WRADvocate for LitWorld’s World Read Aloud Day. She has served as advocacy chair for IASL, Iowa Center for the Book Advisory Council, School Library Monthly, Library Journal and School Library Journal, and Rosen Digital Library Advisory Boards. In 2011, Shannon was awarded the Connecting People Shorty Award and was chosen to be part of the SLJ New Leaders Program in 2012. In 2013, she was named one of the Faces of Innovation from Broadband for America; one of 50 featured in the 2013 Center for Digital Education Yearbook; and one of the featured Connected Educators with the Connected Educators projects partnered with the US Department of Education. On the Classroom 2.0 LIVE! site (http://live.classroom20.com) you’ll find the recordings and Livebinder from our recent “Accessible Digital Content for Everyone”session with Steven Anderson. Click on the Archives and Resources tab. 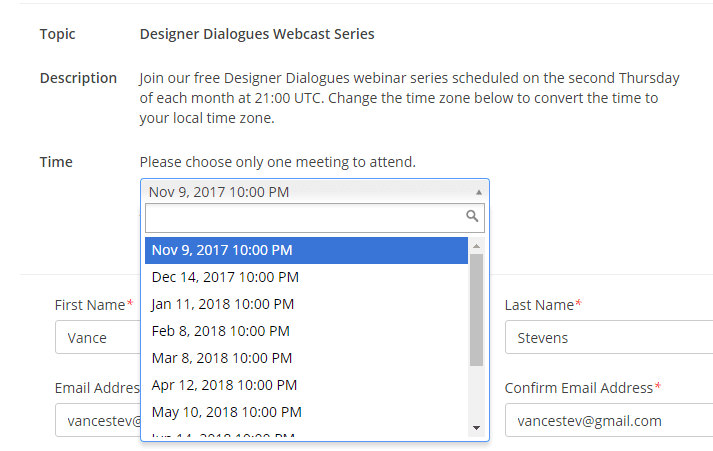 Starting October 12th, join the Designer Dialogues webcast series scheduled on the second Thursday of each month at 21:00 UTC. 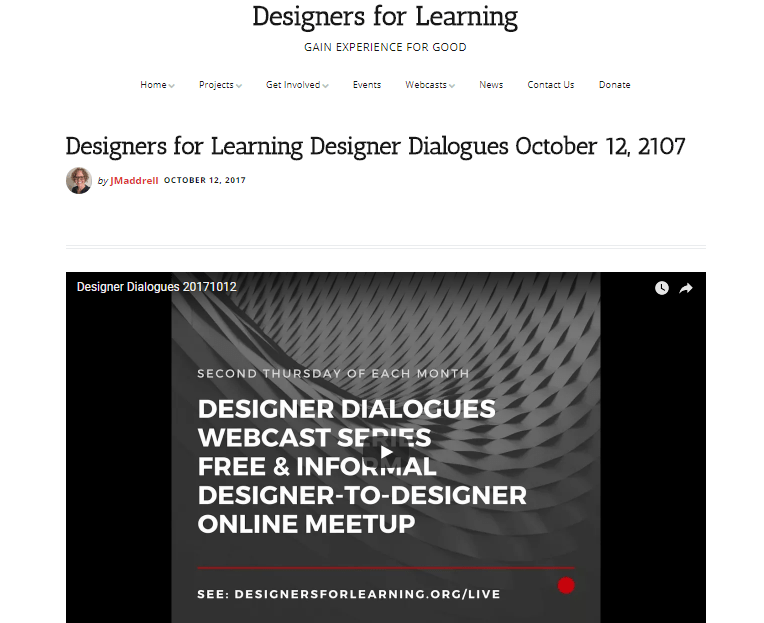 Live webcasts are held using the Zoom webinar platform (see connection options below). To help manage the conversation, the live meeting is capped to the first 100 attendees. The recording will be posted here after the session. If you haven’t caught “Flipgrid Fever” yet, I can guarantee you will have it after you see this inspiring presentation by our special guests, Karla Moura and Sean Fahey! They are passionate, inspired educators who integrate technology throughout their classrooms and lives and they are particularly enthusiastic about Flipgrid as Flipgrid Ambassadors! Flipgrid is a fantastic K-12 resource that is designed to promote open discussion among all students within your classroom. Teachers post topics, videos, or links for discussions and students respond to the prompt and to each other with short video reflections. Flipgrid is meant to provide a digital space for students to share and reflect on ideas with their teacher and with their peers. It is a video response platform where educators can have online video discussions with students or other educators. Teachers can provide feedback to students AND better yet students can provide feedback to one another. Join us to catch the Flipgrid Fever! Both teachers and students are flipping out over using Flipgrid. But why? Learn more about what Flipgrid is, how to use it, and ways to you can implement this incredibly versatile and awesome tool in your classroom to help give students voice and choice in their learning. Karly Moura is an instructional coach and educational technology support teacher at Sun Terrace Elementary School in the Mount Diablo Unified School District in Concord, CA. She supports all staff with the implementation of the Common Core standards as well as with integrating technology in a 2:1 (2 students to 1 device) chromebook/ipad environment. Karly also supports all classes as they rotate through the Sun Terrace STEM lab, working with TK through 5th grade students on coding, robotics, design challenges, greenscreen projects, makerspace activities and more. You can follow and connect with Karly on Twitter at @KarlyMoura. Sean Fahey is currently in his 6th year as a classroom teacher. After receiving his degree in Elementary Education, Sean Fahey began his teaching in a 4th grade classroom. After a few years of changing schools, Sean is a 6th grade math teacher at Throop Elementary School in his hometown of Paoli, IN. Sean is a proponent of replacing the traditional lecture, worksheet, and textbook method of delivering instruction and strives to bring unique learning experiences to his students. He believes that with the continued advancements in technology, the role of a teacher is changing and that student learning experiences can be greatly enhanced with the use of technology in the classroom. Outside of school, Sean is happily married and loves spending time with his wife Amanda and two children. You can follow and connect with Sean on Twitter at @SEANJFAHEY. On the Classroom 2.0 LIVE! site (http://live.classroom20.com) you’ll find the recordings and Livebinder from our recent “10 Ways to Use Buncee” session with Shannon M. Miller. Click on the Archives and Resources tab. Happy New Year! We are energized and excited to return after our winter break with our 9th Annual Anniversary Celebration. In this first webinar of the New Year we will be celebrating our 9th Anniversary on Classroom 2.0 LIVE as well as holding an Open Mic show on a topic all of us will surely have something we can share! “Back to the Future Classroom 2.0 Style”Which tools were you using in 2009 when Classroom 2.0 LIVE first began? What has changed? How do we do these things today? What is obsolete, what’s on the horizon? Share tools, apps, stories, examples, questions. We chose this topic because we felt it was broad enough to include everyone! Join us, take the mic and share your memories, tools, apps, stories, examples, questions and advice. Paula Naugle will facilitate the conversation and we hope you’ll come prepared to share with your headset/earbuds on to take the mic and add to the conversation. We’ll have an awesome Livebinder prepared with resources and will look forward to adding your resources to the Livebinder. On the Classroom 2.0 LIVE! site (http://live.classroom20.com) you’ll find the recordings and Livebinder from our recent “Flipping Out with Flipgrid” session with Karly Moura and Sean Fahey. Click on the Archives and Resources tab.